Supernumerary molar teeth rarely occur in the general population. Their presence particularly in the mandible is rarer. The present study summarizes some retrospective studies on Turkish population with distomolar teeth, presents four cases with mandibular distomolar teeth and the administered treatments. Clinically and radiologically accurate identification of teeth is essential to early diagnosis of distomolar teeth. Although supernumerary teeth occur asymptomatically in most cases, impacted ones may cause such pathological phenomena as pain, infections, diastema, neuralgiform pains, root resorption of adjacent tooth, or dentigerous cyst. Therefore, early diagnosis of these teeth highly matters for a successful treatment. Regezi JA, S.J., Jordan RC. , Oral pathology: Clinical Pathologic Correlations. 6 ed. 2016, USA Elsevier Health Sciences. RAJAB L. D., H.M.A.M., Supernumerary teeth: review of the literature and a survey of 152 cases. International Journal of Paediatric Dentistry, 2002. 12: p. 244-254. Solares R., R.M.I., Supernumerary Premolars: A Literature Review. Pediatric Dentistry 2004. 26(5): p. 450-458. Arandi, N.Z., Distomolars: An overview and 3 case reports. Dental, Oral and Craniofacial Research, 2017. 4(1). Kokten G, B.H., Buyukertan M., Supernumerary Fourth and Fifth Molars: A Report of Two Cases. J Contemp Dent Pract 2003. November; (4)(4): p. 067-076. 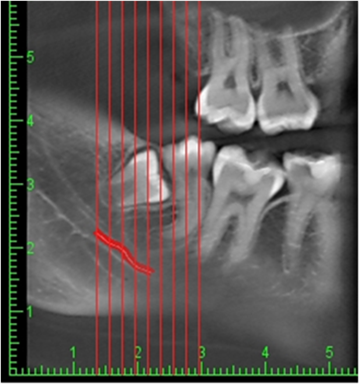 Çatalbaş B., Ç., A. Gelgör E., Sürnümerer premolar (parapremolar) dişler: olgu sunumu (Süpernumerary premolar (parapremolar) teeth: case report). Cumhuriyet Dental Journal, 2011. 14(1): p. 40-43. Grimanis, G., A. Kyriakides, and N. Spyropoulos, A survey on supernumerary molars. Quintessence international, 1991. 22(12). GÜNDÜZ K., Ç.P., Distomolarlar Üzerine Retrospektif Bir Çalısma (A RETROSPECTIVE STUDY OF DISTOMOLAR TEETH). Turkiye Klinikleri J Dental Sci, 2006(12): p. 83-86. Sugimura, M., et al., Mandibular distomolars: a review of the Japanese literature and a report of three additional cases. Oral Surgery, Oral Medicine, Oral Pathology and Oral Radiology, 1975. 40(3): p. 341-345. Şentürk M.F., Y.D., Distomolar Dişlerin Görülme Sıklığı: Geriye Dönük (Retrospektif) İnceleme (Retrospective Analysis Of Distomolar Frequency). Ege Üniversitesi Diş Hek. Fak. Derg., 2017. 38(3): p. 158-163. ZENGİN Z., Ç.P., Distomolarların Retrospektif Olarak incelenmesi (Retrospective Study of Distomolars). Ondokuz Mayis Universitesi Diş Hek. Fak. Derg., 2007. 8( 3): p. 174-178. BARDAK Ç., Ö.B., AKBULUT N. KURŞUN Ş., SÜRNÜMERER MOLAR DİŞLERLE İLİŞKİLİ OLARAK RETROSPEKTİF BİR ÇALIŞMA (A Retrospective Study of Supernumerary Molar Teeth). A.Ü. Diş Hek. Fak. Derg., 2010. 37(2): p. 77-82. Kurt H., S.T.B., Senel B., Avsever H., A retrospective observational study of the frequency of distomolar teeth in a population of 14.250 patients. Cumhuriyet Dental Journal, 2015. 18(4): p. 335-342. Arslan, A., H. Altundal, and E. Ozel, The frequency of distomolar teeth in a population of urban Turkish adults: a retrospective study. Oral Radiology, 2009. 25(2): p. 118. Cassetta, M., F. Altieri, and A. Giordano, Mirror imaging of impacted and supernumerary teeth in dizygotic twins: A case report. J Clin Exp Dent, 2015. 7(1): p. e167-9. Ata-Ali, F., et al., Prevalence, etiology, diagnosis, treatment and complications of supernumerary teeth. J Clin Exp Dent, 2014. 6(4): p. e414-8. Wang, X.X., J. Zhang, and F.C. Wei, Autosomal dominant inherence of multiple supernumerary teeth. Int J Oral Maxillofac Surg, 2007. 36(8): p. 756-8. Ratson T., P.B., Non-syndromic Multiple Hyperdontia in Monozygotic Twin Sisters: A Report of Two Cases. Journal of Dentistry for Children, 2014. 81(1): p. 50-53. P. Batra, R.D., H. Parkash,, Non-syndromic multiple supernumerary teeth transmitted as an autosomal dominant trait. J Oral Pathol Med (2005). 34: p. 621-5. Karayilmaz, H., Z. KirzioĞLu, and A. SaritekİN, Characteristics of nonsyndromic supernumerary teeth in children and adolescents. Turkish Journal of Medical Sciences, 2013. 43: p. 1013-1018. Kaya, E., et al., Prevalence and characteristics of non-syndromic distomolars: a retrospective study. J Investig Clin Dent, 2015. 6(4): p. 282-6. Fardi A, K.-S.A., Bachour Z, Parisis N, Tsirlis A., The incidence of impacted and supernumerary teeth-a radiographic study in a North Greek population. Med Oral Patol Oral Cir Bucal. , 2011. 16: p. 56-61. Berrocal M., M.J., González J., An observational study of the frequency of supernumerary teeth in a population of 2000 patients. Med Oral Patol Oral Cir Bucal 2007. 12: p. 134-8. G. ALBERTI, P.M.M., V. PARODI, Eruption of supernumerary permanent teeth in a sample of urban primary school population in Genoa, Italy. EUROPEAN JOURNAL OF PAEDIATRIC DENTISTRY, 2006. 2: p. 89-91. Schmuckli R., L.C.P.T., Prevalence and Morphology of Supernumerary Teeth in the population of a Swiss Community. Schweiz Monatsschr Zahnmed 2010. 120(11): p. 987-9. Mahabob, M.N., et al., Prevalence rate of supernumerary teeth among non-syndromic South Indian population: An analysis. J Pharm Bioallied Sci, 2012. 4(Suppl 2): p. S373-5. Fidele, N.B., et al., Prevalence and Pattern Occurrence of Supernumerary Teeth in the North-East Heilongjiang Population of China. Open Journal of Stomatology, 2016. 6(02): p. 47. Vahid-Dastjerdi, E., et al., Supernumerary teeth amongst Iranian orthodontic patients. A retrospective radiographic and clinical survey. Acta Odontol Scand, 2011. 69(2): p. 125-8. Jammal Dobles, N. and R. Silva Meza, Prevalencia de dientes supernumerarios en una muestra mexicana. Revista Mexicana de Ortodoncia, 2015. 3(2): p. 88-91. Bereket, C., et al., Analyses of 1100 supernumerary teeth in a nonsyndromic Turkish population: A retrospective multicenter study. Niger J Clin Pract, 2015. 18(6): p. 731-8. Ezirganli, S., Ün E.,Kırtay M.,Özer K.,Köşger H.H., Sivas Bölgesinde Artı Dişlerin Yaygınlığının Araştırılması (The Investigation of Prevalance Supernumerary Teeth in The Sıvas Region). Atatürk Üniv. Diş Hek. Fak. Derg., 2011. 21(3): p. 189-195. Celikoglu, M., H. Kamak, and H. Oktay, Prevalence and characteristics of supernumerary teeth in a non-syndrome Turkish population: Associated pathologies and proposed treatment. Medicina Oral Patología Oral y Cirugia Bucal, 2010: p. e575-e578. Öztaş, B., et al., Clinical characteristics of non-syndromic supernumerary teeth in a cohort of Turkish patients. Oral Radiology, 2011. 27(2): p. 108-113. Demiriz, L., A. Mısır, and M. Durmuşlar, The Prevalence and the Characteristics of Supernumerary Teeth of Children and Young Adolescents from North-Western Region of Turkey. British Journal of Medicine and Medical Research, 2015. 7(5): p. 369-377. Dereci Ö, D.İ.M., Ay S.,, A retrospective study on demographics and characteristics of the supernumerary teeth in western-central anatolian region. Cumhuriyet Dent J, 2015. 18(3): p. 265-271. Çandırlı, C., et al., Prevalence and characteristics of supernumerary teeth in east-northern Turkish population. Cumhuriyet Dental Journal, 2012. 15(4). ALTUN O., D.N., YOLCU Ü, UMAR E., Malatya ve Çevre İllerde Yaşayan Hastaların Süpernümerer Dişlerinin Değerlendirilmesi. Türkiye Klinikleri J Dental Sci, 2014. 20((3)): p. 141-5. Menardia-Pejuan V., B.-A.L., Gay-Escolada C., Supernumerary Molars .A review of 53 Cases. Int. Rech. Sci.Stomatol Odontol, 2000. 42: p. 101-105. Esenlik, E., et al., Supernumerary teeth in a Turkish population. Am J Orthod Dentofacial Orthop, 2009. 136(6): p. 848-52. Arıkan V., O.B., Tulga F.,, Prevalence and Characterıstıcs of Supernumerary Teeth in a Child Population from Central Anatolıa - Turkey. Oral Health Dent Manag, 2013. 12(4 ): p. 269-72. Dereci Ö, D.İ.M., Ay S.,, A retrospective study on demographics and characteristics of the supernumerary teeth in western-central anatolian region. Cumhuriyet Dental Journal, 2015. 18(3): p. 265-71. Shahzad, K.M.R., L. E., Prevalence and management of fourth molars: a retrospective study and literature review. J Oral Maxillofac Surg, 2012. 70(2): p. 272-5. ÖZTÜRK M.H., K.H., POLAT S., AY S., YELER H., MANDİBULAR DİSTOMOLAR (Vaka Raporu). Cumhuriyet Dental Journal, 1999. 2(1): p. 62-63. Thomas S.A., S.E., Pillai S.K., A Study on the Prevalence and Characteristics of Distomolars among 1000 Panoramic Radiographs. Journal of Indian Academy Oral Medicine and Radiology, 2013. 25(3): p. 169-72. Piattelli, A. and S. Tete, Bilateral maxillary and mandibular fourth molars. Report of a case. Acta Stomatologica Belgica, 1992. 89(1): p. 57-60. BEREKET C., Ç.-Ö.N., ŞENER İ. ,TEK M. ,ÇELİK S., SÜRNÜMERER MOLAR DİŞLERİN RETROSPEKTİF OLARAK İNCELENMESİ: KLİNİK VE RADYOLOJİK BİR ÇALIŞMA (RETROSPECTIVE ANALYSIS OF SURNUMERARY MOLARS: A CLINICAL AND RADIOLOGICAL STUDY). Atatürk Üniv. Dis Hek. Fak. Derg. (J Dent Fac Atatürk Uni), 2010. 20(3): p. 176-180. Kara, M.I., et al., Characteristics of 351 supernumerary molar teeth in Turkish population. Medicina Oral Patología Oral y Cirugia Bucal, 2012: p. e395-e400. AKYOL K.U., Ö.-O.B., Bir Grup Hastada Distomolar Dişlerin ve Sebep Oldukları Patolojilerin Yaygınlığı (Prevalence of Distomolar Teeth and Associated Pathoses in a Group of Patients). ADO Journal of Clinical Sciences, 2012. 6(3): p. 1232-1235. K., G., Distomolar olgu bildirimleri. GÜ Diş Hek Fak Derg, 2007. 24(2): p. 115-118. Friedrich, R.E. and A. Reul, Supernumerary Molars and Wisdom Tooth Shape Alterations in Patients with Neurofibromatosis Type 1. J Oral Maxillofac Res, 2017. 8(4): p. e5. Yusof, W., Non-syndrome multiple supernumerary teeth: literature review. Journal (Canadian Dental Association), 1990. 56(2): p. 147-149. Liu DG, Z.W., Zhang ZY, Wu YT, Ma XC., Three-dimensional evaluations of supernumerary teeth using cone-beam computed tomography for 487 cases. Oral Surg Oral Med Oral Pathol Oral Radiol Endod, 2007. 103: p. 403-11. Ferrés-Padró E., P.-A.J., Ferrés-Amat E., A descriptive study of 113 unerupted supernumerary teeth in 79 pediatric patients in Barcelona. Med Oral Patol Oral Cir Bucal., 2009. 14((3)): p. 146-52. Yagüe–Garcia J, B.A.L., Gay–Escoda C., Multiple supernumerary teeth not associated with complex syndromes: a retrospective study. Med Oral Patol Oral Cir Bucal, 2009. 14: p. 331-6. RAJAB L.D., H.M.A.M., Supernumerary teeth: review of the literature and a survey of 152 cases. International Journal of Paediatric Dentistry 2002. 12: p. 244-254. Ehsan, D., H.K. Tu, and J. Camarata, Mandibular supernumerary tooth causing neurosensory changes: a case report. J Oral Maxillofac Surg, 2000. 58(12): p. 1450-1. Gunduz, K., et al., Concrescence of a mandibular third molar and a supernumerary fourth molar: report of a rare case. Br Dent J, 2006. 200(3): p. 141-2. Rao, P. and M. Chidzonga, Supernumerary teeth: literature review. The Central African journal of medicine, 2001. 47(1): p. 22-26. Omer S.M., A.R., King N.M., Determination of the Optimum Time for Surgical Removal of Unerupted Anterior Supernumerary Teeth. 32, 2010: p. 14-20.